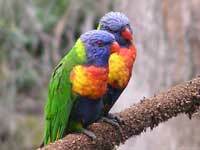 There are roughly 375 parrot species in the world with 56 species in Australia. The estimates vary depending on the literature that's referenced. Strigopidae (New Zealand parrots) - 5 species, all endemic to New Zealand. Species. To clarify, the Crimson Rosella is one species - although there are 6 sub-species or races, including the Adelaide and Yellow Rosellas. There are several races of this parrot. 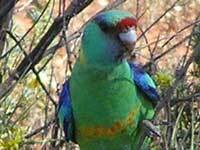 The Twenty-Eight Parrot is named after its call and is found in the south-west corner of Western Australia. 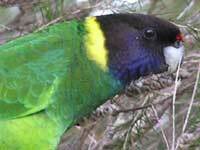 The Mallee Ringneck is found in the arid parts of NSW, Victoria and Queensland. It is distinguished from the other members of its family by its blue/green head and the orange on its chest. 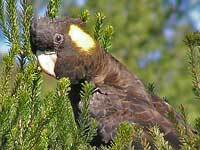 The Port Lincoln Parrot has a yellow belly and no red above its beak and is found in Western Australia, South Australia and into the Northern Territory. 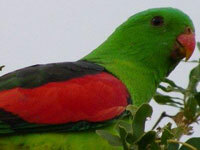 The male Australian King-Parrot has a red head and neck; the female and juveniles are green. They can be found along the length of the Great Dividing Range and coast. 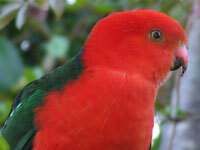 See our Australian King-Parrot profile. 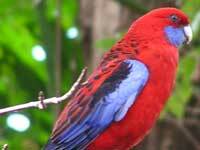 The Crimson Rosella can be found in New South Wales, Victoria and South Australia in open forest areas. It has a distinctive melodic piping call. 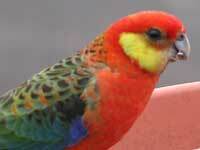 See our Crimson Rosella profile. 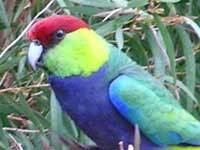 The Eastern Rosella can be found in the Eastern states - including South Australia and Tasmania. Its white cheeks help identify it. 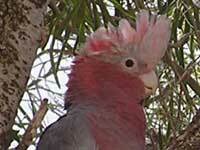 The Galah is found throughout Australia and its numbers are increasing - most probably due to land clearing. 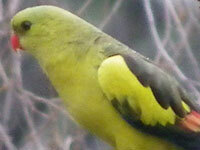 The male has dark eyes; the female red eyes - as this image shows. Here's a great photo by Michelle Abbott. 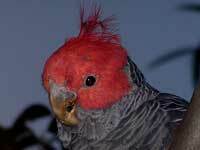 Found in the forests of south-eastern Australia, the male has the distinctive crimson head. Aboriginal legend has it that the Waratah received its crimson colour from the male Gang-gang Cockatoo. Its call resembles a very creaky door. Identified by the blue around its eyes, and lack of red on its chest, the Little Corella can be found throughout the semi-arid regions of Australia. 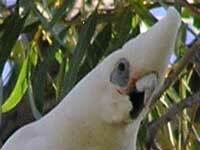 Easily recognised by its exaggerated hooked beak, the Long-billed Corella is mainly found in south-western Victoria. 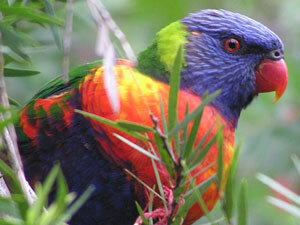 The Rainbow Lorikeet has all the colours of the rainbow. When in groups, they enter into incessant chattering and fluttering about. 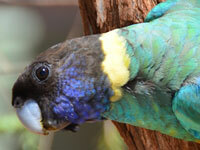 See our Rainbow Lorikeet profile. 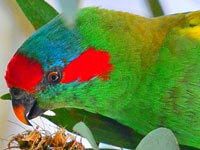 Found in south-western Australia the Red-capped Parrot has a longer slimmer beak to enable it to get into gumnuts. 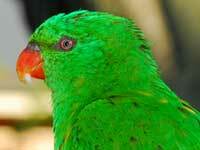 Found along the east coast and hinterland, it is the only Lorikeet that has a completely green head. 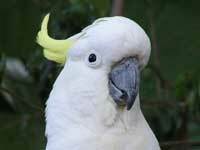 The Sulphur-crested Cockatoo is best known for its loud raucous screeching. 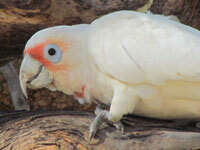 See our Sulphur-crested Cockatoo profile. Found in the south west of WA, the male Western Rosella has more distinct colours than the female which is mottled with green. 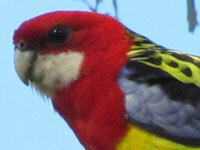 The Eastern Rosella has more yellow on its back and underside, plus it has white cheeks. Found in the lower Murray basin and south-western WA, the male is a more vibrant yellow. Found along the Top-end, most of Queensland and northern NSW, the male has a dark back. 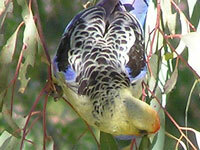 A race of the Crimson Rosella family, the Yellow Rosella is found along the waterways of inland NSW. 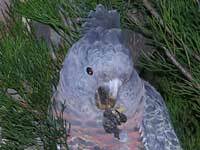 Probably the largest Australian cockatoo, it is found in the south-east coast and ranges from Central Qld to Adelaide and Tasmania. Stunning in flight, the male has a darker bill and a red eye-ring. Found from Rockhampton south to Adelaide plus Tasmania, on coast, ranges and inland slopes and plains. Usually in noisy flocks.